The fee for your endodontic treatment will be based on the extent of treatment. During your first visit we will discuss the probable number of visits, their length, and the fees involved. Endodontic fees usually range from $700 to $1,500 and it is our policy that your care is paid for at the time of treatment. Because of the unique nature of our practice and the specialized kinds of cases we treat, it is not possible for us to accept insurance in lieu of payment. We will, however, estimate your patient portion and bill your insurance carrier electronically for you. We are Delta Dental Premier/PPO, Assurant, Aetna providers. 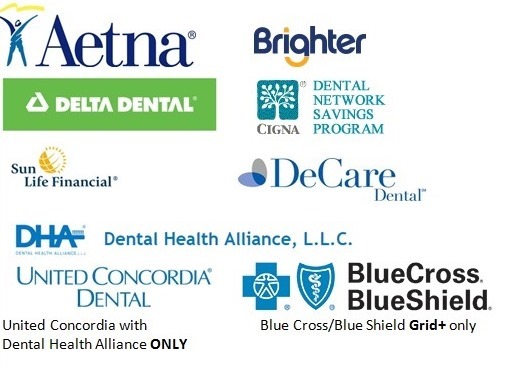 We also are providers for United Concordia if it is part of the Dental Health Alliance Network. Blue Cross/Blue shield GRID + only. Check with your insurance carrier to verify if we are in or out of network. We do accept most major credit cards and can offer you Care Credit payment plans as another option. CareCredit is a flexible patient payment program, specifically designed for healthcare expenses. CareCredit makes it easier for you to get the treatment or procedures you want and need. CareCredit is ideal for co-payments, deductibles, treatment and procedures not covered by insurance. On qualifying purchases made with your CareCredit healthcare credit card account. Fixed Monthly Payment amount based on repayment over 24, 36, 48 or 60 month period. Care Credit now offers an option to pay us if you happen to have a balance after treatment. its a direct method of paying using you Care Credit. Federal and state laws require us to maintain the privacy of your health information. We are also required to provide this notice about our office’s privacy practices, our legal duties and your rights regarding your health information. We are required to follow the practices that are outlined in this notice while it is in effect. This notice takes effect April 25, 2017 and will remain in effect until we replace it.